The conjunction of Saturn, Jupiter and Ketu in Sagittarius, and the transit of Mars in Rohini Nakshara will bring rise in the prices of Crude oil and some diplomatic tensions around the world. Mars joining Rahu in the month of May will increase the prices of essential commodities and there will be fall in the Share markets around the world, due to the danger of war-like situation. THE year 2018 will be remembered for the beginning of Trade wars between the Nations as predicted by me in "Global Economic Trends 2018" in EST January 2018, page 52. I also predicted about the skyrocketing prices of Crude oil. The same trends are likely to continue in the year 2019, with a danger of diplomatic crisis accelerating between the USA and other countries like China and Iran. Donald Trump has initiated a Trade war with China, by imposing tariff on goods import. Trump has also put sanctions on Iran, after he pulled out USA from the 'Iran Nuclear agreement" in May 2018. In May 2018, the global price of crude oil reached at 80 $ per barrel. My prediction: "The transit of Saturn from the fiery sign Sagittarius will bring tremendous fall in the production of Crude oil, leading to sharp increase in its prices. The sky-rocketing prices of Crude oil will affect the common man in developing nations like India, due to increase in the prices of essential commodities." Now in 2019, Saturn will be joined by Ketu in the Sagittarius sign, which will further bring a rise in the prices of Crude oil. On the 23rd of March 2019, Ketu will enter the sign Sagittarius, joining Saturn there, which will later start increasing the prices of Crude oil. Jupiter also will enter Sagittarius on the 28th of March and will get retrograde in the sign on the 9th of April 2019. 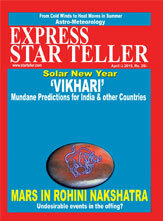 Mars will be in Rohini Nakshara in the month of April 2019. The conjunction of Saturn, Jupiter and Ketu in Sagittarius, along with the transit of Mars in Rohini Nakshara will bring rise in the prices of Crude oil and some diplomatic tensions around the world. Mars joining Rahu in the month of May will increase the prices of essential commodities and there will be fall in the Share markets around the world, due to the danger of war-like situation. Now to understand this situation clearly, we will have to see the foundation chart of various nations and also study their Hindu New Year horoscopes in brief to get a precise astrological inference about the possible economic scenario in 2019. Rahu-Rahu will be in operation from October 2018 to Jun 2021. 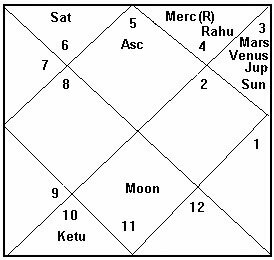 Rahu is in the 12th house of the Leo (Simha) lagna horoscope of USA and its dispositor Moon is in the 7th house of war. Earlier, the economy of USA did fairly well during the mahadasa of yogakaraka Mars, in operation from October 2011 to October 2018. This was during the Presidency of Barack Obama (January 2009 to January 2017), when USA came out of the deep recession and its economy started growing more than 3% of GDP growth steadily for many years. During the Trump era, the unemployment rate decreased due to increase in the production in industry and real estate, creating more jobs. But since Trump has now aggressively pursuing the policy of protectionism and have initiated a Trade war with China, its results are likely to affect USA badly, during its Rahu mahadasa, which is placed in the 12th house of losses. The GDP growth rate of USA may fall below 3%, due to decrease in its export and manufacturing. 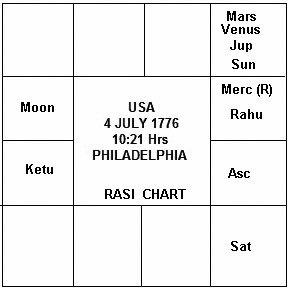 The second half of 2019 will be particularly bad for USA, during its Rahu- Rahu-Saturn period (July 2019 to December 2019). 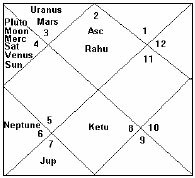 The Saturn as the 6th lord in mutual aspect with Mars shows a danger of war in the second half of USA, which may come at loggerhead with Iran. There is also a threat on the integrity of WTO (World Trade Organization), as Donald Trump may ignore its rulings against USA, which may come in some Trade Rules Violations case. The WTO, which serves as the international Supreme Court for trade related matters, may decide against the USA in a trade dispute with China or some other nations, which will ignite Donald Trump to go against this organization threatening its legitimacy. 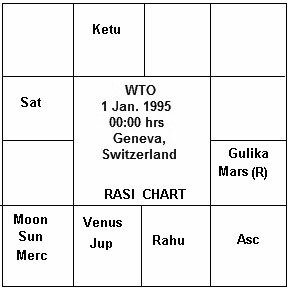 In the Virgo lagna horoscope of WTO, the dasa of 9th and 2nd lord Venus from February 1997 to February 2017 was very good, as the organization facilitated in increasing the international trade in the last two decades. Venus in the horoscope of WTO is in good Raja Yoga with the 4th and 7th lord Jupiter. But ever since the dasa of Sun has started, which is the lord of 12th house in the horoscope of WTO, the organization is facing threats from the insane decisions by US President Donald Trump. Interestingly, it was USA, which had propounded the concept of Free Trade, after the fall of Soviet Union in 1989. The USA wanted to open the market of developing Nations for its products and service, for which he pursued these nations to join the WTO. At the time of fall of Soviet Union and communist governments in East Europe in 1989, Saturn was in Sagittarius. This was the beginning of the era of globalization, which interestingly is now under danger from none other than the USA, who is going towards policy of protectionism under the leadership of Donald Trump. Saturn is in Sagittarius again, after 30 years since 1989, when the concept of global market economy had started reaching developing Nations and communist bloc countries of Eastern Europe, who were earlier been isolated from the Capitalist West, under pressure from the Soviet Union. Now the dasa of 12th lord Sun in the horoscope of WTO and the transit of Saturn and Ketu over the natal Moon in Sagittarius are showing a danger to the legitimacy of this organization. The USA may deliberately ignore some of the rulings of WTO, which may come in some trade violation matters, which will create a crisis in international trade and fall of stock exchange worldwide. The period of Sun-Saturn from December 2019 to November 2020 in the horoscope of WTO will be disastrous, as there will be big crisis in international trade then. The China will be under the Vimshottari dasa of 6th (disputes) and 9th (international trades) lord Mercury, from October 2018 onwards. Mercury is in own sign Virgo, but it is retrograde also, making it strong. 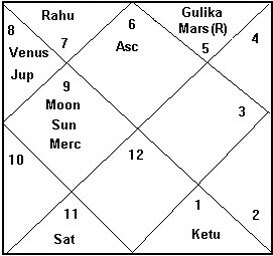 But the close degree conjunction of Ketu, Sun and Gulika with Mercury is not auspicious. The China may suffer some losses, due to trade war with the USA. 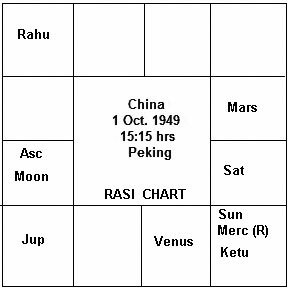 There will be big correction in the Stock Market of China, in the early months of 2019 during the Chara dasa of Gemini-Sagittarius, operating with Atmakaraka Jupiter in Sagittarius sign. The overall GDP growth of China, may remain steady above 6%; but in 2020 when Saturn and Jupiter will reach Sagittarius, then the country may involve in war with India, which will put pressure on its economy. 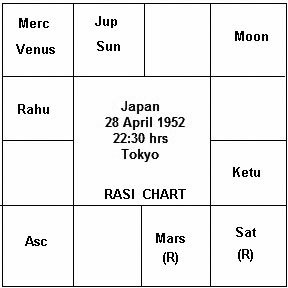 In the Dhanur lagna horoscope of Japan, the Vimshottari dasa period of Mercury-Jupiter from December 2017 to April 2020 is showing progress of its economy. Earlier, the economy of Japan was struggling due to its "Aging Population". Japan, as per its population survey in 2014, has 33% of its population above the age of 65 years, which has made it one of the world's oldest societies. This had put pressure on its economic growth, due to the growing expenditure on social security and health schemes for older people. Now the sub period of lagnalord Jupiter in the 5th house along with the 9th lord Sun in mutual aspect with 5th lord Mars shows a very positive scenario for the economic growth and increase in population growth-rate of this country. Japan's population had began to decline since 2010 but now the trends are likely to get reverse, as per the dasa period in its Foundation horoscope. The sub period of Jupiter placed in its fifth house shows positive changes in its demography with growth in population rate. In Navamsa, the Jupiter is in the ascendant, giving aspect to the fifth house of population. India is the fastest growing economy of the world, growing at the rate of 7.4% and it is likely to be even better in 2019. The VimshottariDasa of Moon-Jupiter from August 2018 to December 2019 shows the astrological possibility of tremendous increase in the domestic demand, which will put India on the track of higher GDP growth. The sub period lord Jupiter is the lord of 8th and 11th houses placed in the 6th house in a 'Vipreet Raja Yoga'. This shows advancement of Indian economy, despite the adverse conditions of international trades, due to trade wars and crisis in WTO. The dasa of planet involved in Vipreet Raja Yoga give progress in the difficult circumstances. The dasa lord Moon and Jupiter are in Kendra from each other in good 'Gaja-Kesari Yoga', which will enhance the reputation of India during 2019 as a good country for investments. But there could be some big corrections in the Indian Stock markets, which is overvalued at present, during this Moon-Jupiter period in Vimshottari. The period around May will be particularly more sensitive, as in the General Elections, the ruling BJP led NDA may not get a very comfortable majority. In the general elections of 2014, the NDA had won 340 seats with BJP getting 282 which was a record since 1984, when Rajive Gandhi had won the general elections with thumping majority, riding on the sympathy wave, after the death of his mother Indira Gandhi. In 1984 and 2014, Saturn was transiting Libra, the sign of its exaltation. 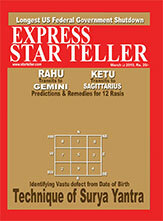 The Saturn is the lord of 10th house in the Foundation chart of India, signifying Central government. 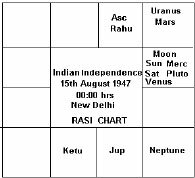 In 1989, the Rajiv Gandhi lost the General Elections, when the transit Saturn was in Sagittarius the 8th house of the Foundation chart of India. Now Saturn is in Sagittarius again, and there may be fall of Stock exchanges in India in the months of May-June in the apprehension of a weak coalition government at the Centre. 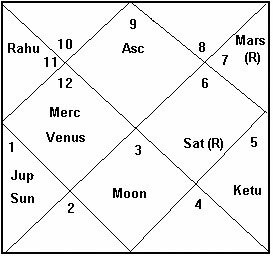 The sub period of 8th lord Jupiter in the Foundation chart of India and the transit of 10th lord Saturn in the 8th house along with Ketu might give surprise fall in the Stock market around May- June 2019. 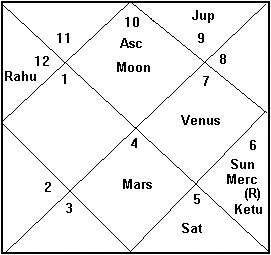 Since the sub period lord Jupiter aspects the 10th house in Rasi chart, the current government will return back to power, but with much weaker coalition, always struggling in the parliament which will give some shivers to the stock market investors expecting higher returns.